As Mary Jo Ruccio completes the transition from her position as ESNT’s first executive director to begin her “second” retirement, I find myself reflecting on how profoundly this organization has been shaped by her leadership and vision. Mary Jo’s incremental approach to change, her commitment and belief in the work, and her steady hand on all matters organizational have guided us through a period of great growth and evolution. She has said more than once that this job used every skill she had developed in her extensive career, and indeed it did. It started with a car ride almost eight years ago. Mary Jo was driving Kate Dacy and me to Cincinnati after a training session in which I had announced my desire to create a nonprofit to hold the Enneagram Narrative work. Kate suggested, innocently enough, that Mary Jo might be able to help me with this endeavor. Mary Jo shared her work experience, and I said I’d reflect on my next step. When we arrived in Cincinnati, we went our separate ways. About an hour later, as Kate and I were previewing a training facility I was teaching in with David Daniels later that week, Mary Jo called to say she had been thinking about our conversation and asked if I would like to meet at Graeter’s, a fabulous local ice cream shop. And so we did. As we talked about the existing structure, I remember being struck by Mary Jo’s astuteness and ability to outline the current situation and the relationship between the teachers and the organization. A few months later, I invited her to assist me in my own strategic planning at our farm in western Massachusetts. We brainstormed, wrote notes on easel paper, made lists and generally reviewed what it would take to move the organization into this new nonprofit structure. It was, frankly, more than just a little daunting when I saw all the “To Do’s” on the list. And then the pivotal moment arrived. She looked at me and said, “When you lead a panel, you create a container for the panelists. Right?” I nodded. “Your intention now is to create a container for the Enneagram Narrative to continue into the future. Right?” All remaining resistance in me melted. That was November 2008. From that moment, Mary Jo managed setting up the organizational structure and taking the steps necessary to file for our nonprofit status, which we received in September 2011. In August 2012, she officially became ESNT’s first Executive Director, responsible for all day-to-day operations as well as managing our major projects. 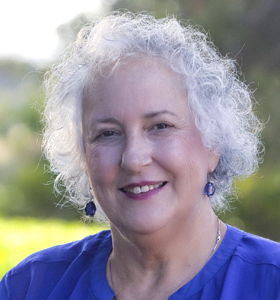 She has planned, guided, directed and implemented all of the significant changes in ESNT, including redesigning our website and expanding our curriculum to include two certification tracks and Enneagram Narrative Learning Communities. While it may sound like this was a linear process and we had planned every step, it was more an incredible unfolding filled with grace. Mary Jo had the skills and talents we needed every step of the way. Her competence, integrity and loving support in good times and bad were invaluable. She was willing and more than able to take the reins as I increasingly stepped out of management of the organization and into the role of Board President. On a personal note, it is very clear to me, that without the partner Mary Jo became for me, my dream would have had a much more difficult time becoming reality. I am profoundly grateful to her. Mary Jo was a great find for us! As Terry says, she had the skills and presence we needed to make a huge transition from a series of temporary LLCs to the current nonprofit organization that will keep Helen and David’s Narrative Enneagram alive and well into the future. One thing that was essential was Mary Jo’s presence and facilitation for our teaching team. She was not only steady with her mediation skills but she also kept the action moving forward – not an easy task. I have great appreciation for her. We would not be where we are today without her huge contribution. Beyond her professional skills Mary Jo brought a spiritual presence that was never pushed on us but supported us in a larger dimension. Many thanks and appreciation to Mary Jo for stepping in with Terry to steer the direction with her steady leadership for continuing the mission of the Enneagram Narrative, and shepherding us through establishing the nonprofit to further the progress of championing and spreading compassion and understanding through the structure that many of us have had a hand in creating and nurturing. She has been instrumental in shaking things up while holding the container for long-term goals, that we are grateful to continue to grow. Thinking of you taking in some much deserved R&R, knowing your heart is with us too. I feel so blessed to have worked closely with Mary Jo over the past seven years. She not only embodies, but also inspires in others, ESNT’s core values of self-awareness, integrity, transparency, personal transformation, commitment to working out differences and generosity of spirit. Mary Jo, I will miss our ongoing conversations, but trust that we will remain friends and allies in the coming years. May your retirement years be filled with joy, loving connections with friends and family, good health, fun travel, relaxation, and many magical surprises! You and I have had conversations for as long as you’ve been with us. In retrospect they always began with how to support the school? Who and Where and What was scheduled? But we kept returning to Why? Why we signed on to do what we do. And how our commitment could deepen. Your steady faith sustained me then – and our talks will doubtless continue. In gratitude for your care of precious things. HI Mary Jo, There are not words to describe all you are and have done for us. I do have a few adjectives: dedicated, dependable, astute, pragmatic, thoughtful, skilled, steady, receptive, and above all warm hearted, compassionate, encouraging, and always there when needed. I feel so supported by you over the years; this has grown and grown. I want you to know how much I appreciate you and love you. Thanks so so much for all you have done. Almost all the words are taken, and I agree with them all. It has been wonderful having you as a colleague these nearly eight years, and even better having you as a friend. You are the best! ESNT would not be what it is without you. What hasn’t been noted yet is how much fun you are to be around, except when you suffer an attack of Kentucky blue fever and become temporarily insane. For your sake (and you know how unselfish this is of me), I wish you many seasons of national championships for your “boys,” and I look forward to many years of hearing all about it. Thank you Mary Jo for everything you have done to support the Narrative. You have been a clear and steady leader. Your efforts have helped bring wonderful opportunities for awareness and presence to me and so many others. Most of all I thank you for being a kind and steadfast friend and spiritual guide. Dear MJ, what a wonderful partner you have been in our work together with ESNT’s sister organization, EANT. So grateful for your steadfastness, insights and resilience as we’ve collaborated over the years. More than that, I’m grateful for our friendship…I am blessed by knowing you. And of course, our kindred spirit on all things feline! Trusting that grace will continue to abound as this next chapter unfolds. What a privilege and a blessing it has been to work with you. I am so grateful for all you have done for ESNT. May your days be filled with much love and happiness. In the short time I have known you, Mary Jo, I have been struck by 3 things in your work with ESNT: your ability to hold and manage many things at once; your holding space for all kinds of different folks; and your deep love for the Enneagram, and particularly the Narrative Tradition. Thank you for guiding and shaping this work to be who we are today. I will miss your wit and wisdom. Blessings in your time of living into a new way of work, rest, and play. Working with you has been one of the highlights of my work with ESNT these past years. I’ve appreciated your deep commitment to the Narrative Tradition, teachers and staff, and your ability to hold often contradictory needs with grace. You embody the qualities of the “servant leader” and inspire them in others. But beyond our work relationship, you always remember to be there for the whole person, and your personal support has been of equal value to me. I wish you joy and fulfillment in your next chapter. It has been totally my honor to work with you. Your capacity as a leader extends in directions that boggle the mind. You have held the mission and values of ESNT in all three centers – head, heart and body . Your humor, intelligence and capacity to facilitate multiple perspectives has been a great gift to all of us and teaching for me personally. I will always be grateful for your support of me as I’ve grown in the organization. I simply love you and wish you many blessings as you move into this new chapter in your life. Wow!. Thanks to Mary Jo for being the GLUE that held ESNT together. As a long time admirer of the Enneagram, and a watcher of all the branches and seedling that have grown up around it since the first book I read in the early 1980s. I am very grateful for this posting so I can get some perspective on all the practicioners and especially on the great work Terry and Mary Jo did together. Syngery! Cooperation. Leadership! Good Stuff. May the Narrative Tradition long continue. Un grand MERCI, as we would say in France, the effect of embodied presence ripples far and wide, just being part of this community, led by beautiful people like you, is one of my most precious ressources. I can’t add much except to say I agree with everyone’s comments above. You are a beautiful person in every way and I look forward to continued contact as we move forward in our common path. It is a joy and privilege to be working with you, Mary Jo. Your welcome spirit and endless energy have been contagious, creating a learning environment that has been dynamic and fun for me! You have laid fertile ground over many years, fostered a network of connections and deep relationships, and have held this organizational container with such openness, warmth, optimism and commitment. Thank you for your generosity of spirit, your humor, and your heart. May this next phase of your journey be richly blessed in all ways! ESNT has been blessed with your innate ability to shape and lead a developing organization. I have had the pleasure of working with you as a member of the ESNT Board, and have come to value the seemingly effortless ease with which you hold and integrate the many complex aspects of who and what we are as ESNT. Your presence and your skill set will be missed. It is with great gratitude that I wish you every happiness and every blessing as you step into this next phase of your life. As I enter into retirement, I am increasing aware of new ‘openings’. I am not sure what those openings are but I am sure that they will appear, just as ESNT appeared in my life eight years ago. These years with ESNT have overflowed with countless blessings. It has been my great honor to share the leadership of this organization with Terry and with the Board of Directors. I want to thank all of you, the teachers, the staff, the board and, in particular, each individual who has contributed to the growth of the narrative. We are changing the world one person at a time and I am filled with gratitude to have shared my journey with ESNT with each of you. I miss you already! As I said in our last staffing call, you have the kind of presence that just makes people want to be around you. I love your directness, your encouragement, and your graceful ease. Thank you for bringing me on board to the ESNT staff, for supporting me in my endeavors, and for being someone I admire and enjoy being with. I look forward to seeing you again soon! It has been such an honor and delight to work for you over the past year and a half. I have been touched by your kindness and encouragement and inspired by the easy way you keep things moving forward. I’m excited for you as you enter this next chapter in your life and wish you every happiness in your retirement. Gratitude for your contribution to the formation of the nonprofit container for Enneagram Studies of the Narrative Tradition. It was a worthwhile process. The organization would not be where it is now without your experience and dedication to be of service to the Narrative Tradition and specifically Terry, Helen and David. Many thanks and well wishing for your well deserved retirement with your family and grand children.